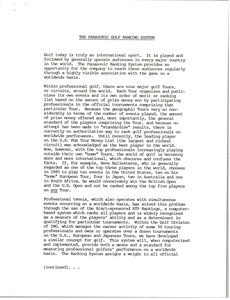 Proposals for the Panasonic Golf Ranking System, an affiliation with American golfer Curtis Strange and "Team Panasonic". Materials proposing a par two small golf course concept and tournament structure. 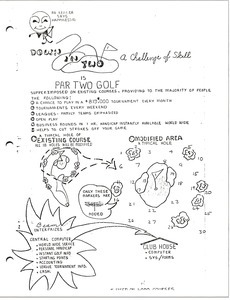 Documents describe the course design, course costs, tournament format, tournament costs, profit potentials. A course income and cost estimate chart is included. 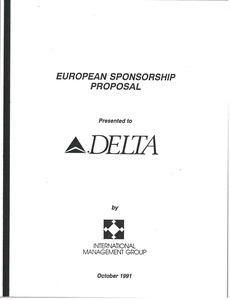 European sponsorship proposal presented to Delta by IMG in October 1991. Focuses on three areas: tennis, golf, and equestrian sport. Includes a list of events in each category and provides general overviews.